Tropical season has started off busy, at least in the Pacific basin, with Category 4 Hurricane Hector, Category 5 Hurricane Lane, and Super Typhoon Maria. The peak of the Atlantic and East Pacific tropical seasons are only a couple weeks away, so we are excited to announce the release of tropical cyclone support within the Aeris Weather API. The new tropical cyclone endpoints create a great hurricane API that includes global tropical cyclone information within both the Aeris Weather API and our Aeris Mapping Platform (AMP). This blog will be part of a series of entries discussing hurricanes, typhoons, tropical storms and other tropical cyclones. First off, we’ll concentrate on the new tropical cyclone endpoint within the Aeris Weather API. As stated by the National Hurricane Center, a tropical cyclone is a rotating, organized system of clouds and thunderstorms that originates over tropical or subtropical waters and has a closed low-level circulation. We often hear of these systems as tropical storms, hurricanes, and typhoons. Per NOAA, the difference between a hurricane and a typhoon is the region where it occurs. 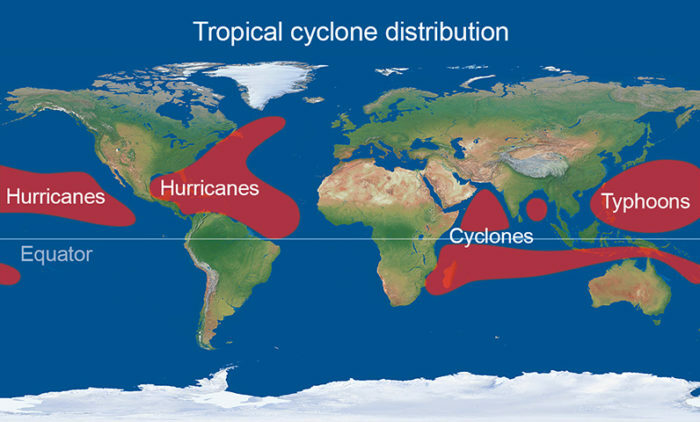 Intense tropical cyclones within the Atlantic, East and Central Pacific are called hurricanes, whereas they’re referred to as typhoons in the West Pacific. Tropical cyclones tend to occur during a specified season when environmental factors and more favorable. In the Atlantic basin, the season extends from June 1st through November 30th. For the East Pacific, the season runs from May 15th through November 30th. The tropical season in the Southern Hemisphere basin starts November 1st and runs through April 30th. The first endpoint of the new hurricane API is the tropical cyclones endpoint and provides information on active global tropical systems, including hurricanes, typhoons, tropical storms and tropical depressions. The endpoint uses data from both the National Hurricane Center (NHC) and the Joint Typhoon Warning Center (JTWC). This endpoint is available for use by Aeris Weather API Premium users, as well as the free two-month developer trials. This endpoint returns a variety of information, such as latest reported position, previous track, forecast track and forecast error cone for active tropical cyclones. Additionally, systems in the Atlantic, East Pacific and Central Pacific may include coastal alerts, known as advisory breakpoints, if the storm may affect nearby coasts. The endpoint documentation provides a full breakdown of the available response properties. Fetching active storms is as simple as calling the endpoint directly without specifying an action. Within the tropical cyclone documentation, we label this the :all action. This query will return all active cyclones across the globe. If there are no active cyclones, the API will return a warn_no_data warning and an empty response array. Tropical systems are grouped into basins including the Atlantic, East Pacific (western coast of North America), Central Pacific (including Hawaii), West Pacific (eastern coast of Asia), Indian Ocean and the Southern Hemisphere/Southern Pacific (including Australia). The API includes the ability to obtain cyclones by one or more basins using the available filter parameter options. If you need to query by the originating basin, then you should use the query parameter. You can pass one or more basin filters to the API. For example, to obtain all active systems within the Atlantic basin, you would use filter=atlantic or use the basin’s two-letter abbreviation, filter=al . A semicolon within the Aeris Weather API acts as a logical OR . Therefore, we are asking the API for active cyclones that are currently located in the Atlantic or the East Pacific basin in the above example. A unique feature of the hurricane API is the ability to query by a location and obtain any tropical systems that are nearby. The feature can be advantageous when a tropical cyclone is near coastal areas. Any of the Aeris Weather API’s supported location formats can be used, including city, US zip code and latitude/longitudes. This query will return all active systems that are forecast to move within 300 miles of Miami, Florida. Active tropical cyclones will normally have a forecast track and associated forecast error cone. Another unique feature of the Aeris Weather API is the ability to obtain cities within this error cone via the affects action. The cities returned or sorted descending based on population. If the tropical cyclone is not forecast to move over land, there are no cities within the error cone and the API will return a warn_no_data warning and an empty response array. Start Adding Tropical Cyclones to Your Apps! The new tropical cyclone endpoint is a great addition and is available to all Aeris Weather API Premium users. If you’re not yet a subscriber, try out the new hurricane API with our free two-month developer trial. Any plans to add to the endpoint, or map layers, to also include model forecasts, to show the popular “spaghetti model” of possible other tracks a system can take? Would also love to see windfields (current and forecast). Thanks for the checking out our new tropical features. You’ll be excited to know that we’re already planning on adding wind fields and forecast models in future updates!